Every time we see him he’s either getting beaten up by little Anankin Skywalker, getting clunked on the head with a moon goddess statue, or shot (first) by Han Solo and left face-down, sizzling. He just can’t win! It’s time to cut him a break, and honor him with something delicious and positive. I’m not sure what a typical Rodian’s diet consists of, but perhaps their skin tone is due to their veggie-filled diet. Going on that assumption, I’ve filled this burrito bowl with lots of green goodness: green rice, green salsa, green tomatoes, etc. 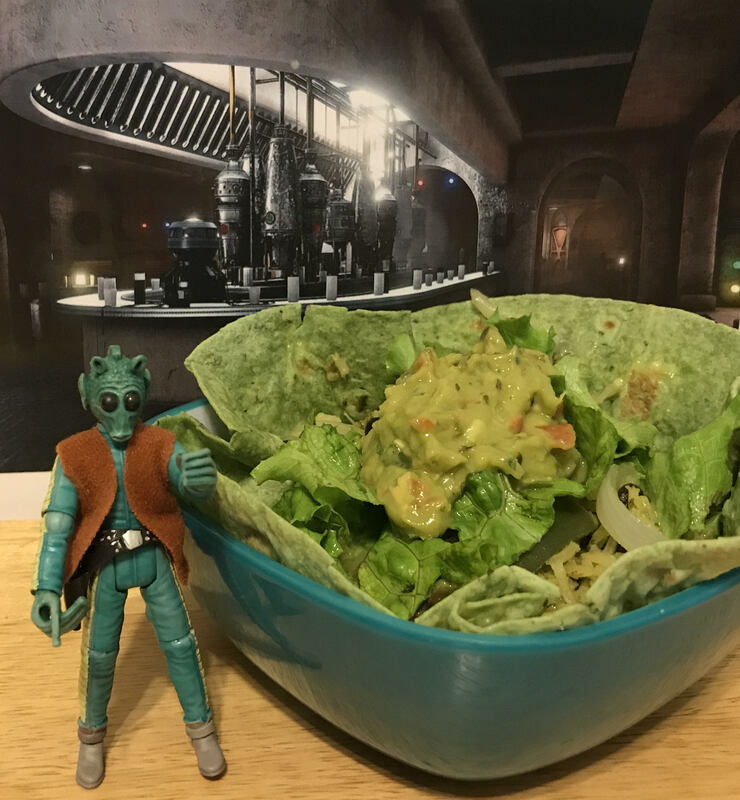 So raise a glass of Yatooni Boska to hapless Greedo, and wrap some long, suction-cupped fingers around this deliciously green burrito bowl. 1. Make the rice: Place the parsley, cilantro, poblanos, onion, garlic, and 1/2 cup of vegetable stock in a food processor. 2. Pulse until smooth, and set aside. 3. Heat the canola oil in a large pot on high heat. 4. Add the uncooked rice and stir to coat all the grains. 5. Allow the rice to brown slightly, then stir and spread out again, allowing all the rice to brown evenly. 6. Add the parsley/cilantro mixture to the rice, and stir to coat evenly. 7. Allow the rice to cook for 2 minutes. 8. Add the remaining 1 3/4 cup vegetable stock, and bring to a boil. 9. Once the mixture is boiling, reduce the heat to medium and cover. 10. Allow to cook for 15 minutes. 11. Remove from the heat, fluff with a fork, and set aside (keep the lid on). 12. Pre-Heat your oven to 200 degrees F, line a baking sheet with parchment paper, and set aside. 13. In a large non-stick skillet, heat oil over medium high heat. 14. Add onions and peppers, and stir for 5-6 minutes, until softened. 15. Transfer peppers and onions to a bowl, and set aside. 16. Put green tortillas on your lined baking sheet and place into the oven, to warm up. 17. Using the same pan you used for the peppers and onions, add the black beans and heat for about 3-5 minutes over medium heat, stirring until they’re warm. 18. Make your Greedo Burrito Bowl:Remove tortillas from the oven. 19. Line a bowl with a warm tortilla. 20. In the center of the tortilla, layer rice, peppers, onions, black beans, cheese, green salsa, lettuce, tomatoes, and guacamole. 21. Squeeze a little lime juice on top, and serve. 22. I’ve been looking forward to this for a long time. This entry was posted in Recipes and tagged burrito, greedo by blastpointspodcast. Bookmark the permalink.